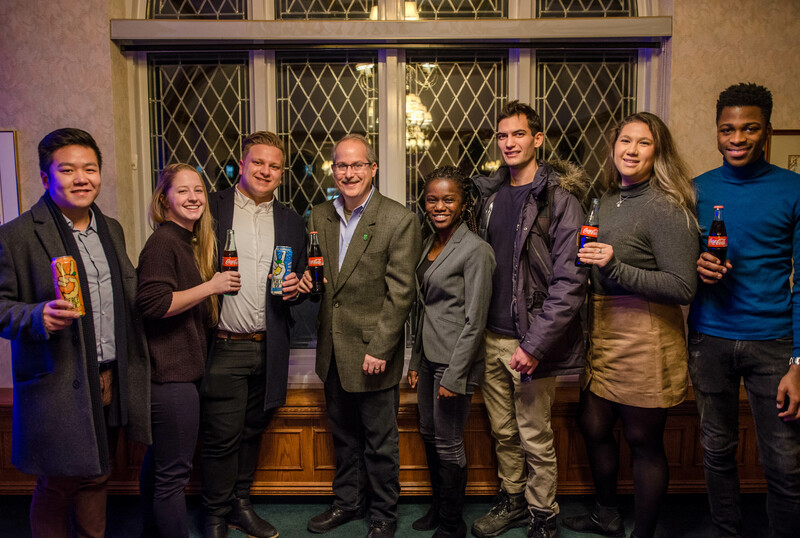 On Wednesday, January 17th, 2018, students packed into Bishop’s University’s Cleghorn Room to hear Mr. Bill Schultz, President of Coca-Cola Refreshments Canada, discuss the company’s history, the value of a liberal arts education to corporations and share words of wisdom. 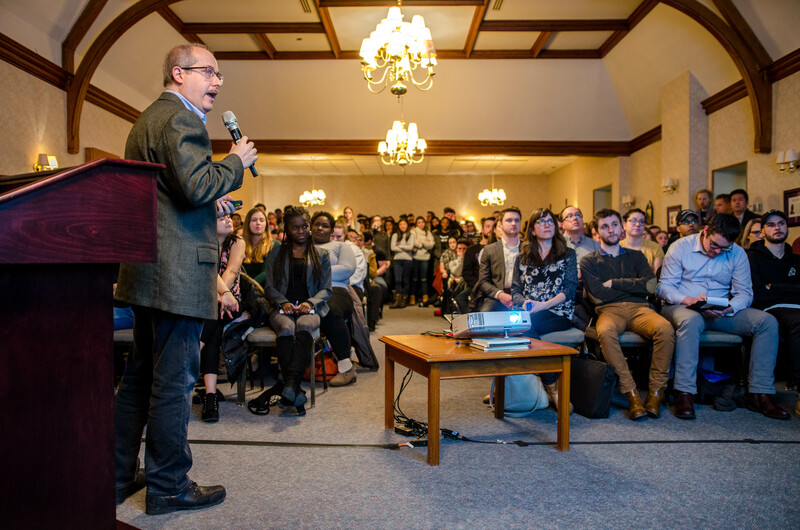 The talk, which was made possible thanks to the initiative of Tova White, Bishop’s alum and VP of Human Resources at Coca-Cola Refreshments Canada, was one of the most-well attended talks on campus in recent memory. 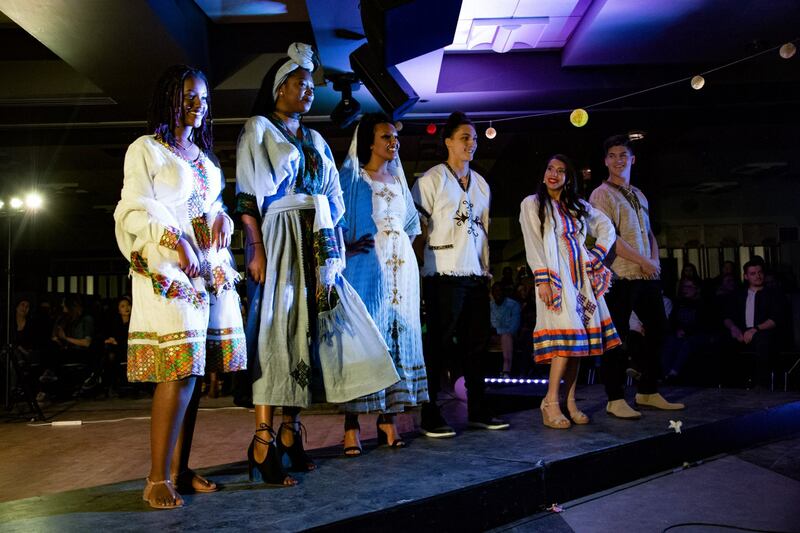 We’ve asked Scott Scrosati, #Ubishops History student, to share his experience of this wonderful event. The talk, titled “Think outside the bottle”, was a unique blend (mostly sweet, sometimes spicy, but definitely refreshing) of corporate history, marketing strategy and career and life advice. The Secret Formula of Coca-Cola’s success, Mr. Schultz told students, was composed of three key ingredients : Innovation, Execution and Sustainability. With regards to Innovation, Mr. Schultz emphasized the importance of thinking ahead of the curve. This advice, which Coca-Cola implements through new research and new products (some of which Bishop’s University students were given the opportunity to taste! ), is also a useful approach to personal growth and continued development, which are at the heart of a liberal education. As for the second key, Execution, Mr. Schultz gave concrete examples of how Coca-Cola implements innovation. These examples, which highlighted an interdisciplinary approach, relied on psychology and diverse sources of knowledge. A key takeaway is the need to understand the people, such as the consumers, employees, and partners, that make Coca-Cola successful worldwide. Reading a graph might be handy in business. Understanding humans is critical. Another point made by Mr. Schultz on the topic of Execution was that what really matters to prospective employers is not merely your title, but what you’ve done. Seeing what you’ve accomplished and your productive use of time will say much more to a prospective employer than what you plan to do. On the final key ingredient, Sustainability, Mr. Schultz highlighted Coca-Cola’s efforts to replenish their water use, increase their recycling of materials, and support various causes and partners around the world. Mr. Bill Schultz, President at Coca-Cola Refreshments Canada, shares words of wisdom with our students. Further, Mr. Schultz gave students some bonus advice. First, he suggested that students remember to enjoy their time at University. Seek the best teachers, he said. Second, he proposed that students should focus on productive action rather than mere activity. Third, he reiterated the importance of continued personal improvement by learning and expanding our horizons. Take time to read books, newspapers, and seek new experiences, he added. Fourth, he reminded students that they should expect ups and downs. Grit, focus and persistence will ensure that we adapt when plans inevitably change. Fifth, he advised students to “take accountability” and “do what you say you will do”. It was nice to see that Mr. Schultz, a former student of history and comparative religious philosophy, lived the principles he espoused. Most members of his family, including those who work in various fields of business, also have Arts and Humanities degrees. A Liberal Arts education is important, he said, because it “helps you learn how to think”. “That’s how you’ll thrive. Not simply by learning stuff. Stuff doesn’t last”, he said. Mr. Bill Schultz’ talk was followed by an active Q&A and a dinner that was well-appreciated by attendees. Mr. Schultz took the time to exchange with students who wanted to know more about his career path, his education and the world of Coca-Cola. Finally, the talk had a personal resonance for me. After I left a corporate job in 2014 to travel and explore new learning opportunities, one stop was to The World of Coca-Cola in Atlanta, Georgia. As a history buff, I was struck by how important Coca-Cola’s history and social engagement were to its brand. 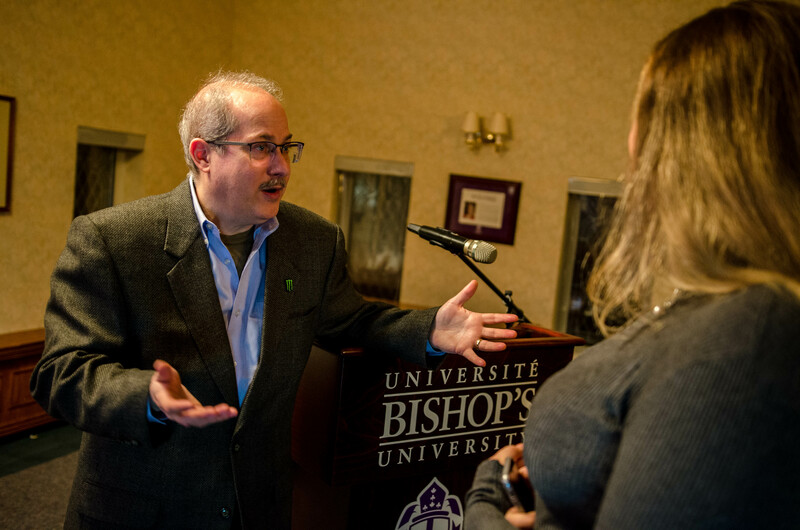 Little did I know that my decision to return to University to pursue studies in History at Bishop’s would give me the opportunity to hear from Mr. Schultz, a Humanities grad who made a successful leap to the corporate world. After his talk, I realized that no door is closed forever. There are many keys at our disposal to open doors when opportunity knocks. A Liberal Arts education is one such key.